Rodeo cowboy Brady Blackburn (Brady Jandreau) is recovering from a traumatic head injury. He lives with his heavy drinking dad and simple, happy sister in a trailer in the Pine Ridge Indian Plantation. His is a setting of sprawl and dust and open space. There are few options for a future in his mind. With rehabilitation he should be able to ride again, but is told by doctors that he shouldn’t. The rodeo was supposed to be his life. It is the only respected job in his circle. Brady has to weigh the overpowering desire to compete, the pressure from his neighbors and friends, and his duty to keep himself safe to care for his family. His is an internal conflict as a result of a nearly insurmountable external injury and Zhao takes us along on his journey of recovery and self-discovery. Brady lives in a world saturated with toxic masculinity. His mother is dead, his father is rarely present and he surrounds himself with other cowboys. They play rough and demand incessant strength from each other. “Cowboy up, grit your teeth, rub dirt in it,” are the ways that they deal with an injury. There is no room for physical pain and emotional pain is meant to be pushed aside. Long after Brady’s head wound has healed he still struggles with a hand that gimps and freezes as he holds something. What could be a more poetic symbol for a character having trouble letting go? Brady adores his sister Lily. She has Aspberger’s Syndrome and at 14 wears only long t-shirts and pajama pants and refuses to wear a bra. Hers is a sprite-like spirit. She sings and plays simply and she is a true friend to Brady. With an unreliable father, Brady knows that if he’s not around to take care of her she will be alone. Some of the most touching scenes involve Brady visiting his friend, Lane Scott who was paralyzed due to injuries from a rodeo ride. There are videos of the young and virile Scott talking about his love of horses and scenes of him riding. The present day Scott can speak only with rough hand gestures and struggles to keep his head up. It is always present in Brady’s mind that this could’ve just as easily been him. Lane tells Brady to never give up on his dreams, but to what cost? While the body can’t be fully controlled, the mind can, and Brady is the only one who can decide how he will choose to live his life. The film looks and feels natural because it is. 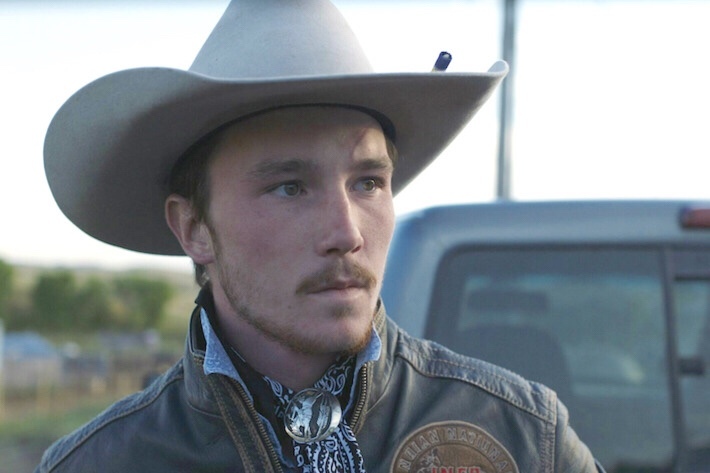 Director Chloe Zhao heard that rodeo cowboy Brady Jandreau was seriously injured in a rodeo accident In 2016. She already knew him and thought that he would be a good actor. She quickly wrote the script for her film The Rider and began filming with Brady playing himself. In so doing she filmed his real injury, his body at its thinnest and weakest and was there as his strength and health returned. It’s obvious to the viewer that Brady and his father and sister (played by his real-life father and sister), aren’t actors. Their natural performances bring a documentary feeling to the picture and present the natural awkwardness of true humanity which is often absent in slick studio pictures. The entire cast of the film is made up of residents of the Pine Ridge Indian Reservation. With glorious cinematography of the Badlands, impressive footage of horses and their unique connections with humans, the film is visually stunning. Zhao shows sense of place with small details, Brady drinking from an old jar, using a shower to small and weak for his body, and then blows the picture out to sweeping footage of the land around them. Made with a crew of six, Zhao has created one of the most intimate and honest American films of the year. Next Free Comic Book Day is Saturday, May 5th – Nation Wide!